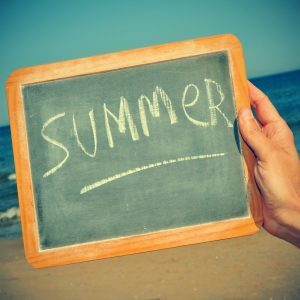 Although summer is everyone’s favourite season, it’s not the best one to sell a property in as people are on holiday, kids are off school and folks want to kick back a bit. Spring and autumn are best, but of course life doesn’t always work to a schedule, so if you find yourself on the market in the summer, here’s a few ideas to help things along. Your grass will grow a lot faster in summer, so make sure you keep on top of it – mow twice a week – more if you feel it’s necessary. The first thing viewers see is the front of your house, so make it look its best – tidy up the garden, keep the path clear and welcoming and paint your front door. Heavy, thick curtains are great for keeping out draughts in the winter, but for summer you want to get as much natural light in as you can. Replace them with low-weight, gauzy drapes or even blinds to brighten rooms as much as possible. A big advantage to summer selling is the longer daylight hours – offer to receive viewers in the evenings, or even in the early mornings. You could squeeze in a few extra potential buyers that way. Clinking ice cubes in long tall glasses, slices of watermelon, maybe even a hot dog and potato salad for the evenings – try to make each viewing an experience they’ll remember. Forget those awful synthetic air fresheners that some vendors assault viewers with – cut flowers, lavender and open windows are all you really need.